Has Coworking Gone Corporate? A Dozen Reasons Why the Answer is Absolutely! A friend moves his company offices to a coworking space, mirroring a growing trend. I caught up with my friend Brian as we rang in the New Year with our old gang (although the kids are teenagers now, we kept to tradition and welcomed 2017 at the more toddler-friendly hour of 10 pm). When the conversation shifted to work, I was surprised to learn he had given up his studio and office in a converted factory building. As managing director of U.S. operations for a China-based 3D printer company, he had opted to move his New York team a few blocks down into one of Brooklyn’s newer coworking spaces not far from mine. And he couldn’t be happier with his decision. For one, no longer would he be interrupted in a meeting to find out why the building’s water was out. “I’m a manager of a company so I have a lot of things to do that don’t involve facilities managing. I don’t want to waste my time with that,” he explained, ticking off the myriad tasks and obligations the coworking space freed him from: utility bills, hiring a cleaning crew, and more. Not to mention troubleshooting those pesky plumbing issues. “It’s made my life so much easier,” he added, a particularly important consideration given he spends significant time in his firm’s Southern California offices. The move also allowed him to downsize from an oversize loft to a space more in keeping with his physical requirements, which were reduced as his staff shrunk over the past year. But it took a change of mindset to truly convince him of the value of a full-service setting. Leaving the status quo – which for Brian meant “taking a lease, getting a water cooler” -- was the first step toward realizing he could leave those things behind. “When I saw this place, I realized that for certain needs, this could be the solution,” he noted of Bond Collective (formerly COWORKRS). “Once I got over the mental wall that said ‘you’re paying five times as much per square foot,’ I realized that we actually gained real estate!” A wealth of uncrowded and varied common spaces gave his team plenty of options. And allowed Brian to leave those operational headaches behind. In its early days, coworking spaces were filled with people like me: free-lancers or solopreneurs who sought an alternative to their dining room table, local library or coffee shop; along with a few small organizations with a handful of employees and minimal space requirements. Now that coworking is in its second decade of existence, the coworking populations are shifting not only to small firms like Brian’s, but also to Fortune 500 companies. Major institutions are setting up up internal or external coworking spaces in hopes of capturing the spirit of innovation and energy often associated with startups and the work spaces where they launch their dreams. Large employers are the fastest growing market for WeWork, according to Bloomberg Businessweek. In fact, 30% of WeWork’s 80,000 members work for companies that rent more than 10 desks. Interestingly the mix includes tech-focused firms such as Dropbox as well as traditional corporations such as General Electric, KPMG, Merck, Silicon Valley Bank, Delta Airlines, and the Guardian. As corporate coworking has gained traction, it has evolved into two primary models, with some related variations. Corporate outpost. This is when companies rent space for their employees at an established coworking environment. It could be for an individual or a small group, and function as a satellite office or simply an alternative workspace. Internal coworking space. In this model, a company designates seats within their existing office as a coworking space open to outside users. Firms in this category include AT&T, Foundry, Open Center, Zappos, and Google. An incubator or accelerator is a variation involving a university partner and/or corporate sponsor with an equity stake. Startups often compete for the privilege of working in the space. In addition to providing the physical facilities at low or no cost, the owner provides support such as mentoring, coaching and access to financing. 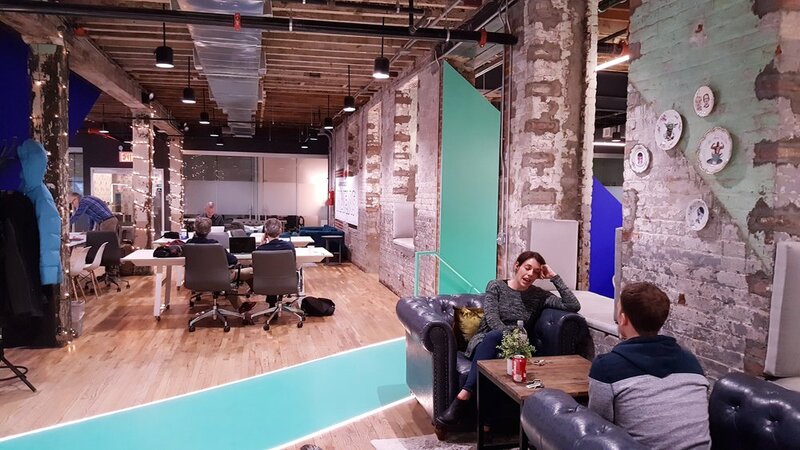 Columbia University’s Startup Lab is based in a WeWork space in Soho, while Clemson University set up its uniquely structured accelerator in a downtown location away from the University. And of course there are various hybrids, some with a decidedly more upscale hospitality bent such as Regus and Serendipity Labs, where 45% of its members are corporate, including Heineken, PepsiCo and Microsoft. At Civic Hall in New York City, a unique collaboration center for civic innovators, Microsoft is one of several sponsors and partners. 1) It encourages collaboration and innovation that help grow businesses. Many coworking spaces are founded on a distinct, non-corporate premise: eliminating unnecessary physical barriers, needless rules and outdated hierarchies. Instead, they often resemble startup offices with open areas and paths set up to encourage random encounters of different disciplines to interact and collaborate with each other. Though actual "owned" offices may be small, a wealth of shared spaces at Bond Collective create a spacious workspace with lots of choice. 2) It provides a network of shared resources, human and otherwise. By bringing together a mix of professionals from different disciplines, coworking spaces create a community with a synergy of services and talent diversity. While solopreneurs and freelancers often seek coworking spaces for the human interaction, businesses large and small benefit from having a built-in network, as Brian discovered in his quest to outsource his accounting function. After a mostly fruitless search calling friends and firms, he went to Bond Collective’s community manager who connected him with exactly what he needed. “It’s perfect. She’s sitting 100 feet away from me,” he exclaimed. “That, for me, was jackpot.” WeWork claims that 70% of its members have done business together. 3) Locations are accessible and convenient. To serve a critical mass, coworking spaces are often situated in dense and/or urban areas with access to public transportation or convenient parking. Lennar, a major homebuilder, rents space near its Chicago and Minneapolis downtown construction projects to make meetings more convenient. Moreover, as lines blur between one’s business and personal life, convenience and accessibility become even more important. Coworking spaces often offer 24/7 accessibility to members who may have nontraditional hours. Likewise, organizations with multiple locations (or independents who unite in an amalgamated model) can offer a membership for frequent travelers that provides offices wherever they might be. 4) It’s a more economical use of space. Utilization rates are estimated at somewhere south of 60%, and even as low as 30% in some studies. Whether that is due to people working outside the office (sales people, consultants, work-at-home) or merely people who are elsewhere in the building (meetings, working in company café or lounge, etc.) most companies don’t need as many desks as they did in the past. Satellite offices typically offer less expensive alternatives, particularly when headquarters locations are in pricey and dense downtown locations. Coworking spaces provide an option that lowers the need for owned and leased space to accommodate regional and global outposts as well as remote workers. It also relieves the corporate parent of leasing and operational responsibilities. Coworking spaces can exude an infectious energy that can revitalize a dormant space and inspire innovative thinking. 5) It provides short and long-term flexibility for occupants. Corporations have seized upon the model because the flexibility of space allows them to weather economic ups and down, like Brian’s firm, as well as lessen growing pains. Scaling up or down as a business expands, shrinks, merges, gets acquired or otherwise changes structure is much easier when a company is not tied to a long-term lease, and instead, can just absorb or unload excess space without having to move out of the coworking community. It also provides individual flexibility, accommodating changing populations and those who do not need a permanent desk, such as contractors, visiting employees, clients and employees who travel frequently. 6) It adds agility to a company’s real estate portfolio. Coworking provides many benefits to building owners. It can be a short term way to lease up space until a larger, long-term tenant comes on board. Its flexibility allows owners and tenants to right-size underutilized spaces. It also reduces financial risk by adding diversity in the size and nature of the building’s occupants. They can also be a tool to revitalize dormant space. With a high energy environment and membership, coworking communities and their members tend to create a “buzz” that invigorates older properties. Engaging spaces, such as a colorful cafe at Civic Hall, encourage collaboration and cross-pollination across disciplines while providing an alternative workspace for untethered knowledge workers. 7) It creates a more engaging and energetic environment. An obvious casualty of the work-at-home movement is what we freelancers discovered early on. It can be lonely and isolating working alone. Coworking spaces nurture a collegial environment that creates a stimulating and engaging setting, not only from the work itself and the passion the individual may have for the for the work, but also from the stimulation members get from each other. 8) It suits today are workplace and workstyle. As I wrote for Knoll in WorkDesign community – coworking spaces epitomize the sharing economy. Some 30% of knowledge workers are untethered from the corporate workplace, allowing them to work in more than one place. Coworking spaces provide an additional venue for employees who work remotely. And within the space are typically a multitude of spaces in which to work, from open tables, to soft seating, cafes and enclosed quiet spaces. 9) It drives engagement and improves productivity. Numerous studies show that providing choice in work environment and supporting autonomy create a more engaged and empowered worker. Engagement drives productivity and worker satisfaction. Highly engaged workers are not just more production, they say they are better able to focus, complete tasks in less time, are more creative and have a higher standard of work. What corporation wouldn’t want to provide such an environment? 10) It enhances recruitment and retention. Coworking spaces deliver on the workplace criteria that matter most to millenials: choice, autonomy, and urban locations. Some 75% of coworking centers located in city and mixed use communities that cater to millennials. Many companies who host coworkers in their space use it as a talent acquisition strategy. What better way to onboard someone who’s already had a test drive? Many studies point to chemistry as the key driver in hiring decisions. Why not live together before getting married? Varied work venues, such as at Civic Hall (top) and Bond Collective, make workers feel empowered and engaged, driving productivity and satisfaction. Sometimes the courtship can lead to even bigger things. At least one major pharmaceutical firm is believed to sponsor incubators as a due diligence process to gain real-time insight into a potential acquisition. 11) It’s more eco-friendly. Cutting out long-distance commutes with a more local workplace conserves fuel, eliminates emissions that cause air pollution, lowers commuting stress and saves the most valuable commodity of all: time. And, much like a city bus takes multiple cars of the road, gathering a loft-full of independent workers who formerly worked at home into one commercial space saves on lighting, heating and cooling. 12) It delivers a higher level of infrastructure, amenities and services than home-based alternatives. When going to a workplace is optional – as it is for most coworking members – companies need to provide a compelling environment where people want to come to work. Within their energetic, well-appointed setting, coworking spaces typically provide higher end technology, better connectivity and collaborative technology for remote work. Many offer professional-level recording booths, photo and/or film studios and 3D printers along with services such as receptionist, community manager and maintenance crew. Snacks are always available in some form and awesome coffee is a given. A high level of amenities at coworking spaces like Bond Collective encourage employees to come to the office, even when they don't have to. Well-appointed offices also provide more physical support that makes for a healthier and more productive work experience, such as sit-to-stand desks, ergonomic chairs, large monitors, high quality printers, views and offices filled with natural light. Does it solve every problem? Well, not necessarily, as Brian recently discovered. In addition to his corporate responsibilities, Brian has a few side ventures related to his earlier vocation as an architect. Those projects require a different type of studio space. So after a brief run working out of a mini-storage, he decided it was more economical to lease an office back at, you guessed it, the converted loft. Afternoon cookies and open pathways build community and spur spontaneous interactions at Bond Collective. Which just proves once again, that whether corporate or independent, with a singular focus or multiple gigs, today’s worker needs varied options. If they check out their local coworking space, chances are they'll find a winning solution: a networked community of members with a sense of purpose thriving in a productive, collaborative and empowering environment. Works for me. Untethered is a curated collection of news, trends and thoughts about mobile working enabled by technology by Carolyn Cirillo, a Brooklyn-based design writer, researcher and brand strategist.